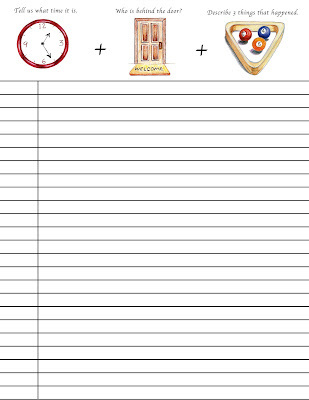 Grab your free Writer's Notebook lesson here. If you are a writing teacher, you know the drill. Each year students are assigned to your class who cringe at the thought of putting pen to paper. These students share the same space with a handful of enthusiastic writers who believe every word that hits their notebooks is destined to be part of the next critically-acclaimed novel. The problem is clear: How can you motivate resistant writers and challenge gifted ones without having to create multiple assignments? The solution is simple: Use Writers' Notebooks! 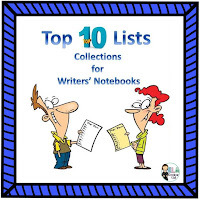 A Writer’s Notebook is a blank book in which writers record lists, generate free writes, and practice writing strategies which may eventually serve as the basis for more formal writings. So how can you use a blank book to consistently motivate resistant and prolific writers? ...bring out the list lover in them. ...let them dramatize every single writing session. ...get them to gobble up grammar. 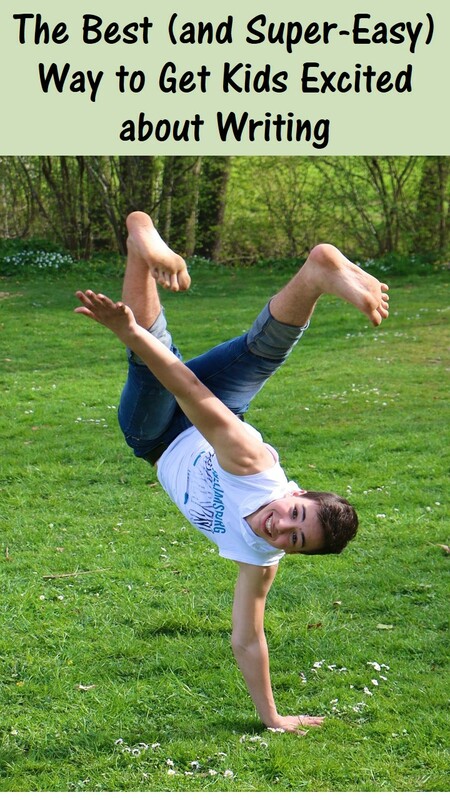 Let's take a look at how each of those lessons work, and why kids love them. The first part of the notebook – the Collection Section – is reserved for list-making. Fallon has his Pro/Con lists. Letterman had his Top Ten lists. Magazines feature What’s Hot/What’s Not lists. And internet experts offer Pro Tip lists on almost any topic you can imagine. Lists. We can’t get enough ‘em! Why? Because a quick scan of an interesting list can pique our curiosity, organize our thinking and stimulate our creativity. So if we keep active lists while we read and before we write, the payoff is that it will help us to read like writers and to write like readers. That’s quite a hefty benefit for such an easy and enjoyable task. 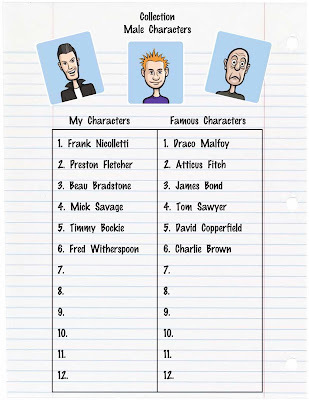 Students create original names and collect famous names. 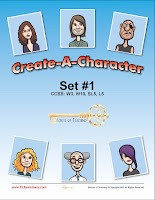 Download a free set of cartoon character pics here and try it with your students. 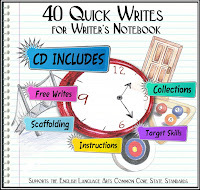 The second part of the notebook – the Free Write Section – is where writers craft short pieces of timed writings. We all need to have a little drama in our lives - whether we'd like to admit it or not. A conflict (real or imagined) pushes energy through our bodies and makes us feel alive. When there’s a problem to solve - and short time to solve it - our creative juices start flowing and we feel compelled to bring that situation to a satisfying resolution. Free write sessions combine all three components necessary to satisfy this compulsion: An assignment is announced, a timer is set, and a 3-12 minute writing frenzy begins. Simply put, the components are: Get ready. Get set. Go! Why is free writing so effective? As we listen to the assignment, several problem-solving strategies swirl in our heads. The time restriction adds a sense of urgency that forces us to sort through ideas quickly. And because everyone knows that this drafting session will produce very rough (and often very messy) pieces of writing, nobody expects them to be perfect. 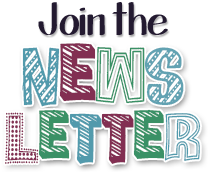 Bottom line: Sharing free writes is non-threatening and engaging for both readers and listeners. Have a male character go though a door at a specific time. Write three things that happened to him on the other side of the door. Download a Free Write lesson here. 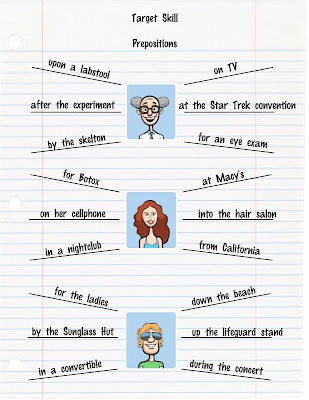 Last third part of the notebook – the Target Skill Section – is the place to play with grammar, mechanics and language. Prepositional phrase webs can be used as pre-writes and reference guides. Thanks for stopping by. If you are a Writer’s Notebook fan, check out the Writer’s Notebook offerings in my store. If you have a favorite Writer’s Notebook lesson, please share it here!